In 2017, Jeremy Sparks became the first-ever Prosci-Certified Advanced Practitioner. Read our interview with him below about his experience throughout the certification and his keys to success. 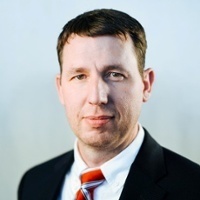 Jeremy Sparks leads the organizational change management practice at a Fortune 100 company. The multinational corporation is a leader in the food industry with major holdings in poultry, prepared foods, and fresh meats. Jeremy joined the company in 2013 as a change leader after serving in the active duty military. Jeremy is an award-winning and best-selling author who currently serves in the Air National Guard. 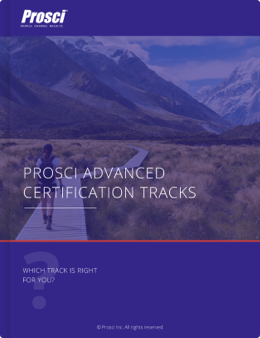 What brought you to Prosci and the Advanced Practitioner Certification? Prosci is the industry standard for organizational change management certification. Prosci’s credibility, thought leaders, and research were all factors that I found attractive. As I sought to further establish my credibility as a change leader and trusted advisor, I was looking for a challenging program that was also relevant. What was your impression of the Advanced Practitioner Certification Track when you started it? “This is going to take longer than I planned!” My advisor, Courtney, was extremely helpful and flexible. When I started the journey, she told me, "I’m here for you – on your time, at your pace. You let me know how to best support you.” That really set the tone as I didn't feel pressured to be on a call every week. What did you appreciate about the Advanced Practitioner Certification process? The modules were relevant and foundational, like the Project Change Triangle and eBest Practices Audit modules. But then you had the electives, which were very insightful as the focus shifted from, "I know how to do change management" to "I know how to think about change." So moving from tactical application to strategic application was a win for my current and future roles. I really enjoyed the electives. Prosci's done a good job of offering a variety of electives allowing customization to what fit personal development goals and company needs. That's why I picked things like Change Management and Agile, as it’s a very relevant and timely topic in our organization. I also appreciated the challenge the Advanced Certification presented. In total, it took me just over a year to complete and by no means was it a breeze. I definitely had to prioritize the work and research. While you were completing your certification, you had an in-flight project produce some pretty impressive results. Tell me a little more about that project. It was an SAP implementation where we were moving from six legacy trade management systems to one unified platform to manage our trade programs and promotions. And not only were we combining systems, our goal for this new technology was to provide more granular data which would enable our leaders to make better business decisions. What were the results of that SAP implementation? We achieved our immediate objectives. Out of the gate, we eliminated all six legacy systems. We streamlined our trade processes and exceeded our KPIs by implementing more automation than we originally planned. We have a few KPIs that will continue to be measured annually, for five years post go-live, and we're currently achieving those targets as well. Based on the outstanding work of team members throughout the organization, we achieved what we set out to do with this implementation. Not to mean there weren’t some pain points along the way. But we did decommission systems, streamline our trade process and use the technology to provide more granular business data as promised. Additionally, the success helped catapult our change capabilities as we demonstrated what change management looks like done well. What advice would you give to somebody who is looking at enrolling into the Advanced Practitioner Certification? If org change is your passion, if you want to be on the leading edge of research and application, this is the perfect program. When considering a certification, people typically look at two things; time and cost. And from there, we think, "Either I have the time or I don't," and "Either I have the money or I don't." But I would look at this through the career lens and ask, “Is change management your career path?” For the organizational change professional who is seeking to have a distinguished career and be a thought leader in the field, I believe the Advanced Practitioner Certification is a step in the right direction. One final question. You have been very successful at this. You are the first Prosci-Certified Advanced Practitioner. What do you think helped you finish this with the success you've seen? My company deserves a lot of credit for investing in professional development and personal growth. Knowing that my company was behind me, leadership was supporting me, and my team was encouraging me - those were all keys to completion and success. We are actively accepting new change practitioners into our three Advanced Track programs. For more information on each of the tracks, download the guide below. The Advanced Certification Tracks are highly researched, comprehensive trainings for dedicated professionals looking to further their knowledge and competency in change management.